I was fortunate enough to receive one of the AHRA Annual Meeting Scholarships in 2017. Without the scholarship, I would not have been able to attend the annual meeting because my facility, like many others, does not offer an annual travel budget. It’s official: our 2018 annual appeal campaign is underway! This is the main fundraising event for the AHRA Education Foundation (EF) where we appeal to the AHRA membership for support. 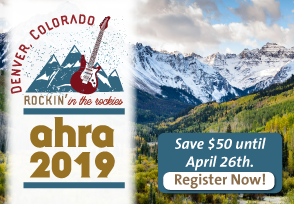 AHRA has taken the “At Your Service” adage to a new level by bringing their educational learning opportunities right to their members’ offices with the 2017 Virtual Fall Conference.